Made of a heavy duty FOOD GRADE stainless steel. 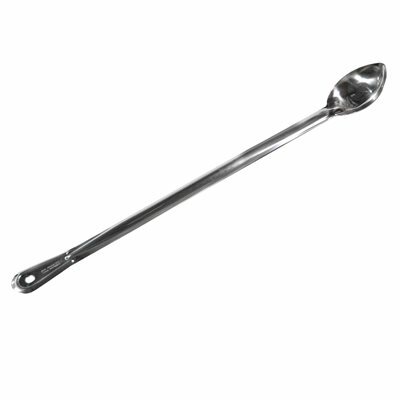 Longer than other stainless steel spoons. Has a pointy end and is hard to bend. Perfect for mixing and stirring. Handle of the spoon fit all The Vintage Shop PET Carboys. 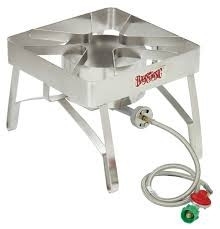 Banjo burners allow you to spread heat over a larger surface area and run a lot quieter than the standard 4 inch burner. This is the burner our Beer Geek is always raving about when it comes to bang for the buck. With a wide 16” x 16” cooking surface and a strong, stable design, brew outdoors to your hearts content with this Classic Banjo Cooker. Designed to support large stockpots from 14” diameter up to 100-quart. 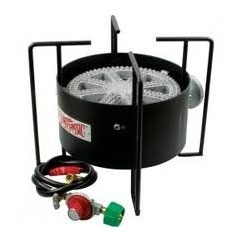 The KAB6 cooker uses a maximum power 10 inch cast iron burner. The stand is 13 inches high with an 18 inch surface capable of supporting 40 gallons. Includes a 30 psi regulator and extra long 4 foot hose hose. You supply a standard propane tank. The KAB6 will hold a 55 gallon drum! The 'Banjo Burner' is named for the huge cast iron heart of this boiling machine. This is the most power you can get out of a portable propane tank! Excellent flame distribution and high burn efficiency. There's nothing to lose with this top-of-the-line cooker. 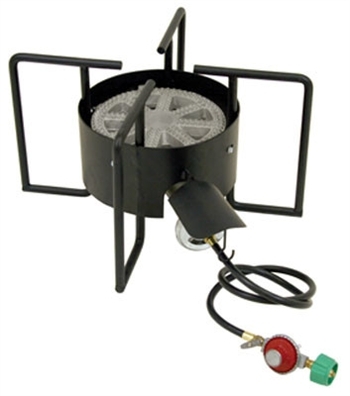 Compact high pressure propane burner puts out approx. 55,000 BTU, perfect for 5 gallon batch sizes. 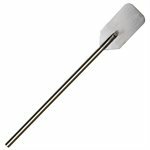 The 21" tall stand allows for convenient gravity transfer into your fermenter. 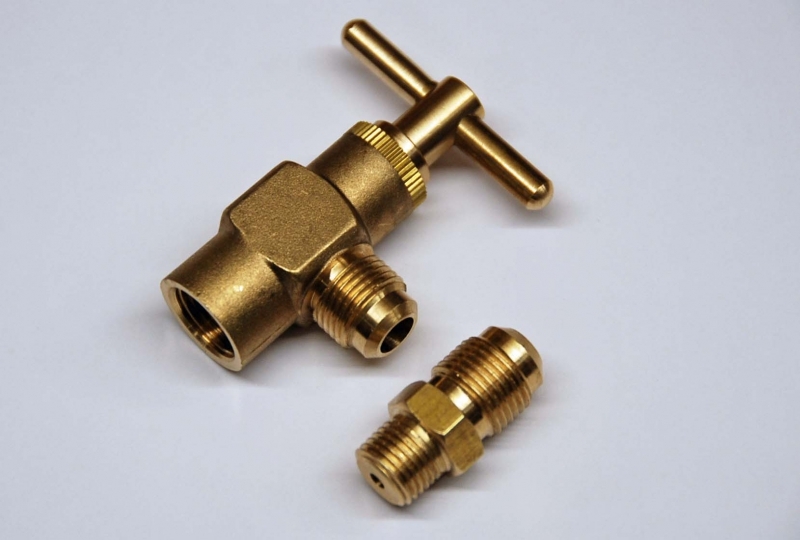 Comes complete with Regulator and hose. High pressure burner 55,000 BTU. Bayou Classic does not recommend using the SP50 with any stockpot larger than 44 quarts! Designed for large pots, up to 40 qt capacity. 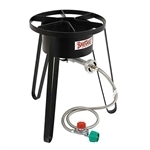 This SS84 cooker stands 13.75" tall, includes a 10 psi regulator and is constructed out of stainless steel It can support a pot with up to 25 gallons of liquid with a diameter of 12" minimum. Hand carved in the USA from a single piece of hardwood maple. 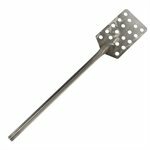 Our mash paddle has a very smooth, sanded finish but is oil free so as not to transfer any foam killing oils into your beer. Small circular hole at top of handle allows for easy hanging in your brewery. Paddle is 28" long, and is great for 5-20 gallon batches.